Weasel Trek: Boston: The Weasels Are Coming! The Weasels Are Coming! Boston: The Weasels Are Coming! The Weasels Are Coming! Anka rejoined her siblings this morning after visiting Paul Revere's Grave, Paul Revere himself (who was, suspiciously, loitering near his own grave), and Old City Hall, all courtesy of Ryan Gabbard. 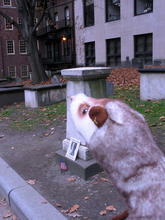 While in Boston, she also visited the famous Green Dragon Tavern, Old North Church, and, of course, Hahhhvahhd Squaaahr. Ed. Note: That should be "Harvard Square." Apparently it's difficult to talk with your mouth sewn shut.